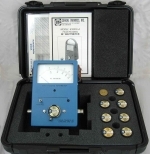 Custom protective storage carry case for Coaxial Dynamics RF Wattmeters. Rugged Plastic shell with custom foam cutouts for the wattmeter and 11 elements. Cutouts for four connector series adapters. See picture above. Carry case only, contents not included.